When we moved into our current house, we were thrilled to have more a bit more space (including a finished basement for all the kids’ toys & Lego’s). But, a couple of drawbacks were losing my closet room and having a smaller master bath. 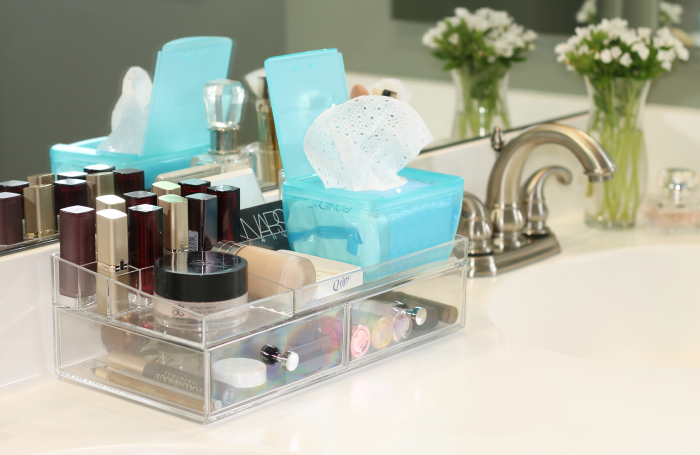 Because there are no drawers in our bathroom (or shelves in the under-sink cabinets), it has made storage and organization a serious challenge. I can be a little obsessive when it comes to having things left out (read: clutter makes me crazy), so it was crucial that we came up with a solution to this problem. 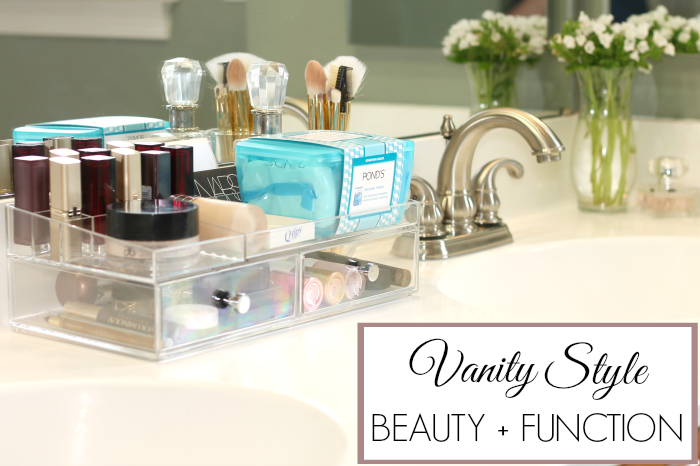 After locating this vanity organizer, I was so happy to see that I could keep all the things I needed on a regular basis in plain sight without ruining the aesthetic of our bathroom. This way, everything I use frequently is right within reach and I don’t have to go digging through a storage container underneath the sink for something. One of my new favorite products that I’ve been using often is these POND’S Original Fresh Wet Cleansing Towelettes. They are the first wipes I’ve tried that my sensitive skin didn’t negatively react to and it makes removing my makeup so quick & easy on evenings when I can’t wait to fall into bed. 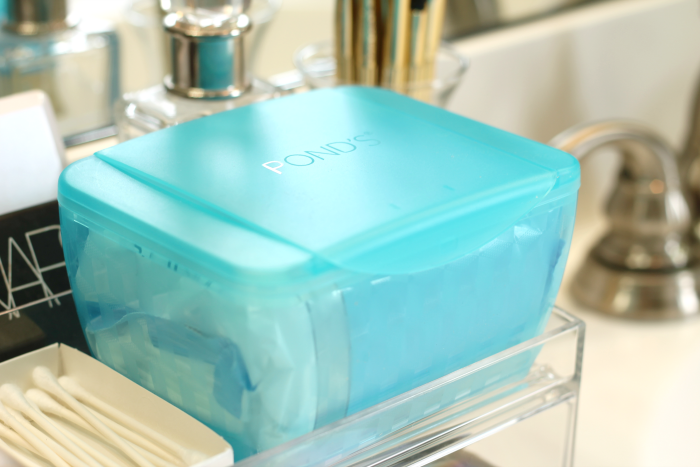 POND’S partnered with the talented Jonathan Adler to design an exclusive box for these towelettes – you can find the blue container at Walgreen’s and the green one is sold at Target. I love that the color & pattern is pretty enough to leave out (I have one in our bathroom & one in the guest bath for visitors), plus it’s refillable so I can keep using it over & over again. There’s nothing better than when beauty & function come together. 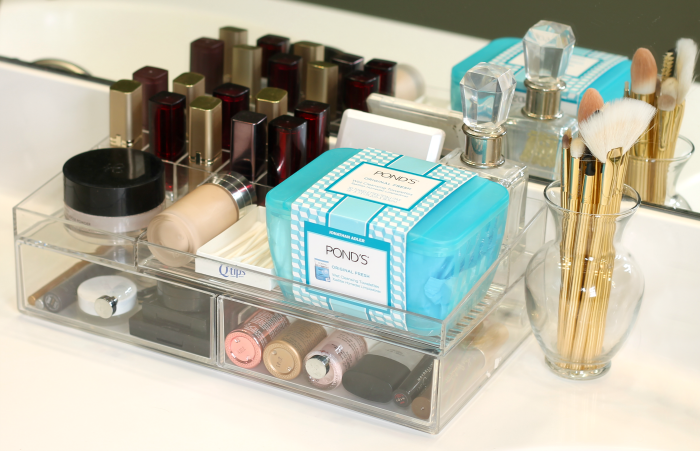 Visit POND’S Pinterest for more vanity styling inspiration & skin care tips.